The Spring Conference was held at Plumpton College, near Lewes, Sussex, at the beginning of April. The programme included a trip to the Weald and Downland Museum, which was very much enjoyed. A highlight of the conference was the presentation of the first Joan Thirsk Memorial Prize, awarded for the best book in British or Irish Rural or Agrarian History published during 2016. 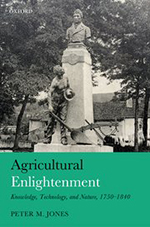 Martin Thirsk, Joan’s son, presented the prize to Prof. Peter Jones of the University of Birmingham for his volume, Agricultural Enlightenment: Knowledge, Technology and Nature, 1750-1840 , published by Oxford University Press. Announcing the winner, Dr John Broad, President of the BAHS, said, ‘Since January, the judges have been reading the entries ... All the entries were of a high standard and worthy of serious consideration. Interestingly, three of them had a significant ‘transnational’ comparative element which we enjoyed and felt was well done. Although we had marginally different views of the merits of each book, were were unanimous in awarding the prize to Peter Jones.